With global wellness poised to be the next trillion-dollar industry, the WELL Building Standard® is taking its place as the benchmark for professionals who want to advance the health and wellbeing of the buildings and communities they design. “Enhancing the human condition” is our vision at INTEC Group, so we’ve all been learning more about the WELL Building program and how to optimize our designs for its seven “core concepts” of Air, Water, Nourishment, Light, Fitness, Comfort and Mind. Two of our associates, Meredith Goldberg and Howard Chapman, have been the first on our team to become certified WELL Accredited Professionals. By investing in built environments that follow the WELL Building Standard, the healing effect that is often measured in healthcare facilities is brought to the corporate world. The attention to the seven core concepts has the impact to sustain a level of physical and mental health for its employees that can measurably minimize healthcare costs across the board and positively affect the financial bottom line for corporations. In addition to health measures, the formulas for WELL Building create spaces that directly affect recruitment and retention success. This is crucial to the overall success of businesses and is a leading return on this investment. 1. Quiet zones throughout the office. “We included a variety,” Meredith said. “Some where people can relax, meditate or take a power nap – all shown by research to improve productivity. Other spaces are for ‘heads down’ work, designed like the old library concept to aid concentration.” What we are finding is that office environments need to accommodate a cross generational demographic, where choice is a key component to accommodate a variety of different work styles. These quiets zones provide just that and are purposefully small, tucked away, and exposed to nature. The upholstered seating is integrated within wall enclosures to maximize the essence of nurturing and quality of refuge, two key components to biophilic design and WELL Building strategy. 2. Universal access to daylight. 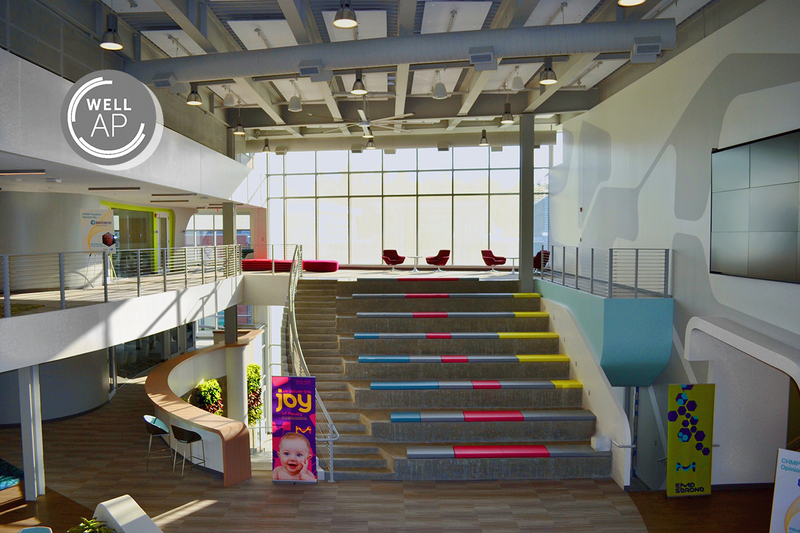 WELL supports the concept that everyone has a “right to light.” Howard said, “We designed open work stations right beside the windows. Natural light aids circadian rhythms and a connection to the outdoors reduces stress and promotes productivity.” When coupled with the opportunity of choice and direct engagement through transformative architecture, employees can then have the ability to control the amount of daylight and visibility through glass to accommodate a variety of meeting types within one single space. This provides a methodology of meeting the needs of a new and future workplace, where more and more firms are asking for ways to maximize the use of smaller real estate footprints while maintaining a healthy work environment. 3. Beauty and design optimization. “This is all about the mind,” Meredith said. “Creating beautiful forms or branded spaces through graphics and artwork creates a space that is wonderful to be in. For EMD, we used graphics in bright colors and cellular shapes to tie into their biotech brand.” The spatial qualities of this workplace are carved out of unique organic forms in contrast to familiar rectilinear walls. By replacing the familiarity of standard straight walls with more organic forms, studies in biophilic design and WELL Building Standards show that our cognitive thinking makes a switch when processing the unfamiliar, allowing humans to reach a higher level of creative thought and brainstorming. For many in research and creative industries, this is of great value. 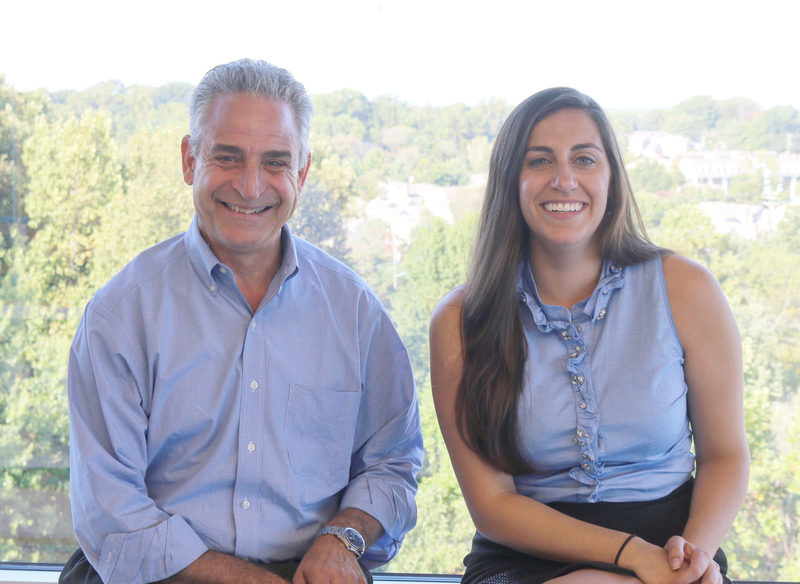 Their experience with WELL’s accreditation program and the opportunity to apply it to EMD Serono’s space has only increased Howard and Meredith’s enthusiasm for its future possibilities at INTEC Group. Interested in getting your building WELL certified or learning more about WELL AP accreditation? Drop Meredith an email at mgoldberg@intecgroup.net or Howard at hchapman@intecgroup.net.